This Diablo 3 Demon Hunter Leveling Guide overview will give you general information and thoughts about the demon hunter class. In later chapters of the guide, we will discuss more in-depth hints for the fastest demon hunter leveling with Diablo 3! The demon hunter class is a band of vigilante warriors who seek nothing else but vengeance for the lives of loved ones taken by the demons throughout the land. Tormented by the memories of their lost families, they travel the land with a sole purpose; to destroy each and every demon they cross, one by one. The demon hunter is best described as an insanely over-powered version of Van Helsing. Firing dual crossbows, laying traps, and performing leaps and rolls to avoid harm, demon hunters are skilled and nimble fighters, worthy of their highly-regarded reputations. With most of their prowess in the form of ranged attacks, demon hunters tend to be a bit vulnerable at close range. For this reason, their evasive maneuvers and cunning traps are often relied upon to make it through a heated battle unscathed. In addition to their dexterous ranged combat skills, demon hunters also have mastered several forms of shadow magic. These mystical skills allow the demon hunter to slip in and out of shadows to evade and subsequently ambush their unsuspecting enemies. Abilities such as their Smoke Screen and Preparation skills remind me a bit of the rogue class in World of Warcraft, making the demon hunter somewhat of a hybrid form of a hunter and a rogue. Playable in both male and female versions, demon hunters in Diablo 3 will surely derive great benefit from the dexterity attribute, as it will most likely enhance both their offensive and defensive abilities. 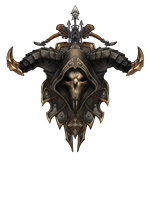 The demon hunter is the only class to have a dual resource, hatred and discipline. I think this is a really clever way of imbuing a lot of personality into the demon hunter class and really paying homage to their history of torment and subsequent revenge. The hatred part of the demon hunter resource globe regenerates very quickly and is used as the main resource for almost every offensive attack. As the story goes, their hatred for the demons of their world fuels their inner fire and drives them to continue eradicating this mortal enemy. Discipline is the demon hunter’s yang of their yin-yang resource dichotomy. Discipline is a slowly-regenerating but very valuable resource that is primarily defensive in nature. It is the demon hunter’s discipline that mitigates their hatred and blind rage, allowing them to assess their situations with a level head and escape from harm’s way when needed. Thusly, discipline is the main resource for all defensive abilities such as acrobatic maneuvers and evasive action. The signature demon hunter weapon is most certainly the quick-loading hand crossbow. The demon hunter is so proficient with this weapon that they are able to dual-wield them, firing a massive barrage of bolts at their target with deadly accuracy. Other weaponry also available to the demon hunter are one-handed axes, daggers, one-handed maces, one-handed spears and one-handed swords. Additionally, demon hunters can wield bows and regular crossbows. Demon hunter armor tends to be a bit flimsy at first, with light leather gear covering only the most vital regions such as the chest, wrists, and neck. However, as the demon hunter gains more experience and levels up, they gain access to far better armor such as thicker leather, enhanced with solid metal plating. 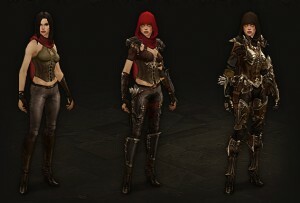 At the highest levels in Diablo 3, demon hunter armor offers the player access to a nearly impenetrable suit of steel and leather, augmented with a wide array of useful components such as hooks, spikes, and protective head armor. For a bit of added protection, the demon hunter is also able to use a shield. Demon hunter traps serve both as a viable offensive ability as well as a defensive escape mechanism. Because of their relatively weak melee combat skills, demon hunters rely on their traps to ensnare and weaken their enemies to sometimes escape and other times grant them an easy kill. I would have to say that demon hunter traps have the largest potential for providing interesting and creative game-play when choosing to level a demon hunter through the perils of Diablo 3. It will be exciting to discover some of the many scenarios in which traps can be utilized to bring about victory.